Five 2019 250SX Eastern Regional Supercross Championship main events are in the record books and so far Monster Energy / Pro Circuit / Kawasaki’s Austin Forkner has won all five of them. 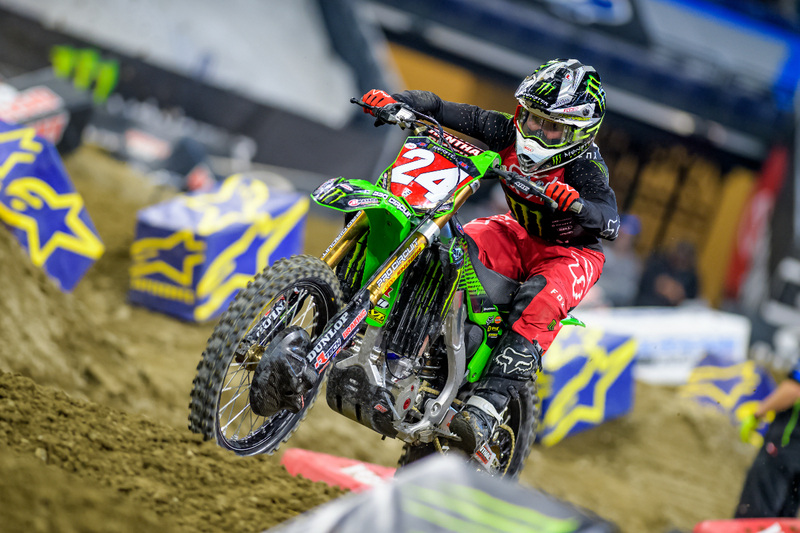 Austin was only good enough for third in the Atlanta SX 250SX East / West Showdown main event, but the only two riders that were able to finish in front of the #24 were from the 250SX West. After the first six main events, Austin leads the series by 26 points, a whole race cushion. With just a few races left, that’s a great place to be. Heading into the 2019 Indianapolis SX, Austin had gone undefeated in heat races, but a crash while leaving the first turn with the holeshot resulted in the #24 getting run over and starting dead last. When the heat race was over so was Austin’s heat race win streak, but he still possibly saved his perfect main event streak by charging all the way back to qualify with a 5th. It was the first adversity the young pro has experienced in ’19, but he collected himself like a veteran and charged through it. In the main event, Austin went on to do what he’s basically done all year long: holeshot, lead every lap and win. This is the third main event of the year that Austin has led every lap, and only two other riders in the East—Jordon Smith and Kyle Peters—have laps led in the 250SX East so far in ’19. 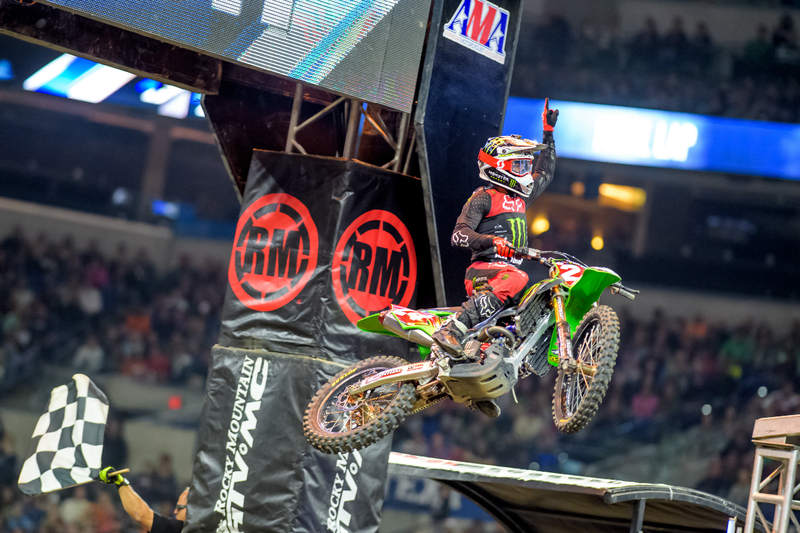 It all boils down to confidence and when Chase Yocom talked to Austin on Saturday night in Indy, you could tell Austin was feelin it. Check out Chase’s interview with Austin below. Austin, another great night for you. You just gotta be absolutely ecstatic to get outta here with another win. Yeah, I extended my points lead to 26. That’s a full race point lead now. It obviously doesn’t really change anything. Still the end goal is to get the championship and keep winning races. That’s my fifth win. That is the most races I’ve ever won in a year. I’m stoked about that. I’m stoked with meeting some of the goals that I wrote down at the beginning of the year. My trainer told me to write down my goals for this year like how many races I expected to win and how many times I want to be on the podium. Obviously, I expected a championship and just what I wanted to accomplish this year. I feel like I’ve definitely already exceeded kind of those goals. I just need to keep it going to get that championship ’cause that’s the important one. I think tonight was the first heat race you didn’t win this year. You had some difficulties but then you were able to make it look so easy in the main. It was crazy. It’s hard to argue with the #1 sign. Your confidence is already pretty high with all your wins and stuff. But how much more of a confidence booster was tonight with you actually having to deal with some adversity? Honestly really good ’cause it just proved to myself that it doesn’t matter what happens leading up to the main event, the main event is what it’s about. That’s where you get the points. That’s where you get paid. I can make it happen no matter what happens throughout the day before that. I just need to get that through my mind. And today was actually the best qualifying session I’ve had just riding. I didn’t crash like I have been this year. Just overriding the track a little bit and trying to be the fastest. I just rode and I ended up fastest. So that was good. I’m confident I would have won the heat race if I hadn’t have jumped into the tough blocks. I just went into the first turn too hot. Honestly, my trainer said that he was so pumped about my heat race. Because last year at this time if I would have done that in the heat race, I probably would have crashed again because then I would have had a bit of a freakout. And then start writing over my head and maybe ran into guys. Because I had to come through the pack and we were coming through so fast. He was like, “I’m really really happy with how you rode and how you just managed the heat race.” That gave me confidence too. I went up to the line knowing that I needed to make it happen, and this is kind of a make or break situation tonight. Not for the championship by any means—I have a comfortable gap. Just for myself, mentally overcoming something that happened like that in the heat race and quite simply making it happen, was something that I was really pumped about tonight. Austin’s whoop speed is probably the biggest improvement in his game for ’19. 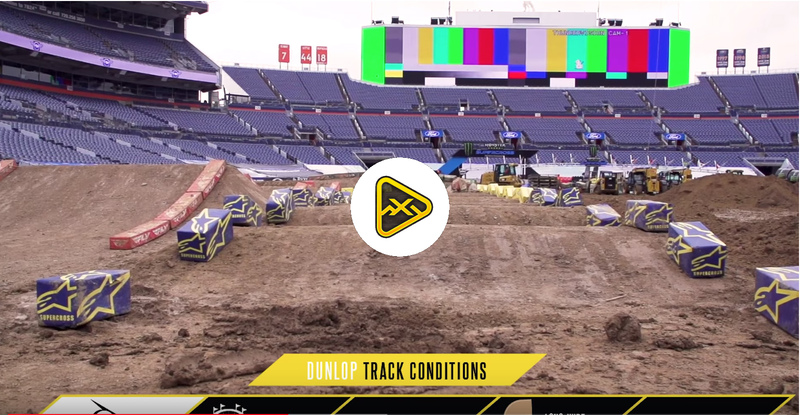 How difficult did the track get in the main? Obviously, we’re in Indy, it gets super rutted here, and the dirt is usually a little bit softer. It looked brutal out there. You made it look easy, but how brutal was it? It was pretty gnarly. We had to end up jumping through the whoops, which we’ve done a few times this year, so it wasn’t super weird. I’m actually getting really good at jumping through the whoops. Just be consistent lap after lap and not doing anything stupid. It seems like on these types of tracks, that’s been my strong point this year. It seems like in the main, it doesn’t matter how tough the track is. I guess the tougher the track is for everybody else, the more smooth and consistent I can be. The track was definitely tough tonight, but, it wasn’t like anything I haven’t already ridden this year. There’s been a few races where they’ve been pretty tough, but, um, this was probably, I mean, one of the more sticky dirts that I’ve ridden this year. You have a break coming up, what do you have planned for that? You’re probably excited to get this little bit of a break, but with all this momentum you probably want to keep this ball rolling too. You know, I’m happy that I get a break. I got to kind of a cold right now. Obviously, a little bit banged up after this race, but I do, I want to keep the ball rolling. Like I’m excited for it, but I also don’t want to settle, you know. I want to just keep the ball rolling and keep doing what I’ve been doing because it’s been working. I mean, clearly.